Marshall Academy of the Arts recently dedicated a new fitness room, complete with state-of-the art equipment funded by a $40,000 UCLA Sound Body Sound Mind grant. For more than a decade, UCLA Health Sound Body Sound Mind has provided modern fitness centers, fitness education curricula and educator training to schools across the country. With 100 fitness centers serving more than 100,000 students every year, the organization also has trained more than 400 educators on its curriculum. The organization's focus is fighting childhood obesity by installing the equipment in middle and high schools. At Marshall, the middle school's students helped to demonstrate the new equipment during a grand opening ceremony for the fitness room, complete with the school's jazz band, cheerleaders, student dancers and school district leaders. Schools that have implemented the research-based Sound Body Sound Mind program have seen significant gains in the number of students passing state physical fitness exams. 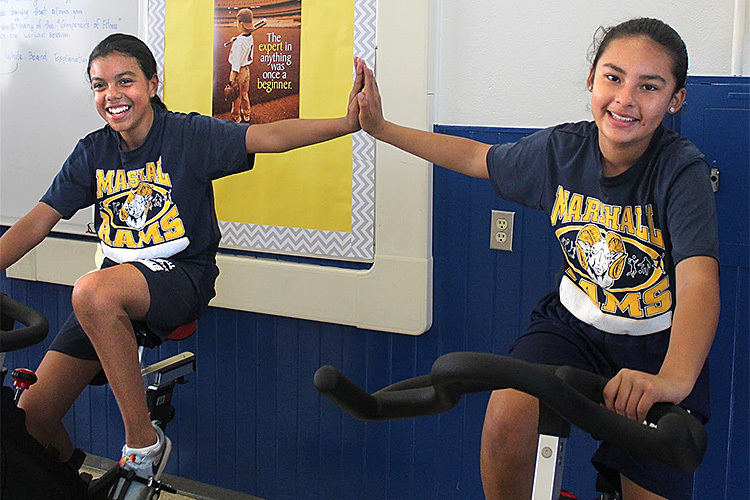 FITNESS GRANT – Students at Marshall Academy of the Arts demonstrate new fitness equipment.